Emergency Dentists USA is the place to find the right emergency dentist in Aurora, Illinois no matter the emergency. Here at Emergency Dentists USA, we have a large selection of dental clinics that can meet your needs during your dental emergency. No matter when your dental emergency begins, Emergency Dentists USA has the right dentist for you 24 hours a day. A quick call to the Emergency Dentists USA hotline connects you to an operator who will set you up with the right emergency dentist to meet your needs without the hassle of you having to do all of the searching. Whether you have a knocked out tooth or a lost filling, there is a dentist there to help you. 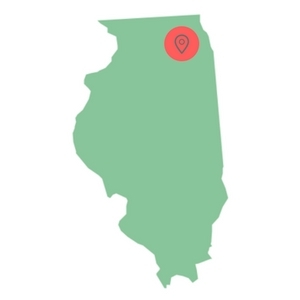 Aurora, IL is easily accessible through five interchanges and offers much in the way of activities for the family, so don’t let a dental issue slow you down. Let us help you find a solution fast and easy. Don’t let finding an emergency dentist in Aurora, Illinois be a hassle. When it comes to finding an emergency dentist, we at Emergency Dentists USA have a comprehensive list of qualified dentists to meet your needs. The city offers both emergency 24-hour services and after hour dental clinics. Emergency 24-hour dental services are offered in Aurora to help you should you have a dental emergency in the middle of the night or in the early morning hours. Keith A. Brown Dental offers emergency services available 24/7 should you have such an emergency. They also offer routine dental services during normal business hours. After hour dentists are dentists that stay open later than the standard 5 pm time. They are designed to help you get the dental care when you need it even later in the afternoon than standard. In Aurora, Gentle Family Dentistry is open late on Monday and Tuesdays until 7pm and they have extra time slots built in during the week to treat emergencies. Downer Place Dental stay open Monday through Friday until 6 pm and has appointments available on Saturdays until 1 pm. Emergency Dentists USA is an excellent source to provide you with a listing of qualified emergency dentists in the Aurora, IL area. There are a variety of dental clinics available which include an emergency 24-hour dental clinic and after hour dental clinics. Aurora is a beautiful place to live or just to visit and has the right dentist to meet your needs should you have a dental emergency. Our listings are both accurate and up-to-date, and they are there to help you to find the right dental treatment should that need arise during your time in Aurora. Description We understand from firsthand experience that when you are traveling on Interstate 80 cross-country, the worst thing you can encounter is a severe toothache. If this happens to you, our easy to use hotline will help you within minutes, to locate someone who can take a professional look, and get you back on the road in no time. This after hours dentist in Aurora, IL is considered one of the top places in the Fox Valley to get help if you require same day assistance. They cater to families and focus on providing patients a relaxed environment. Services include cleanings, fillings, crowns, wellness exams, root canals, dentures, restorative cases, and of course urgent care. Better yet, if you require a payment plan, they offer 0% interest. So consider giving this outfit a call as a weekend dentist in Aurora, IL is not easy to locate and their hours include Saturdays and late evening appointments. Description: Headed up by Dr. Phil Lerlihey, this walk in dentist in Aurora, IL is capable of delivering ER services to those patients needing immediate help during evening hours. With late office hours on Monday and Tuesdays and a willingness to work with patients stricken with toothaches or other dental mishaps, the Gentle Dentistry Group is uniquely positioned to serve the community. They employ the highest standards and the staff is continuously engaged in education to better ready themselves for the changing dental landscape. Description: If you are looking for a dentist open on Saturday in Aurora, IL or the Naperville area, then Dr. Keith Brown may be the oral physician for you. You may ask yourself why choose this clinic? Well, when you take into account their employment of the highest technology, digital X-Rays, affordable payment plans, and focus on minimizing invasive dental procedures, you should realize they have a first class facility. They advertise 24 hour emergency services and when you really need help from a dentist, that type of appointment flexibility could come in handy. A visit to your Aurora, Illinois emergency dentist is like visiting your regular dentist. The emergency dental clinics provide the same routine services including things such as fillings, cleanings, and x-rays along with more extensive treatments such as extractions and infection care. When you are going to visit your emergency dentist in Aurora, bring along your most recent dental records and x-rays. Also, bring along your identification and dental insurance cards. It is best to arrive at least 15 minutes before your scheduled appointment. This allows you time to fill out any necessary paperwork that your Aurora dentist will require. This time also allows you to ask any questions you might have in regards to your upcoming procedure. Most dental clinics take cash and credit cards as a form of payment, but check with them to be certain the form you are choosing is accepted at your Aurora emergency dentist. Be certain that your Aurora emergency dentist accepts your dental insurance. You insurance plan may require you to visit an in-network dentist to cover the visit. Knowing beforehand can save you money. Take a list of any of your current medications and supplements along with you to your Aurora emergency dental appointment. Let them know if you have any allergies before your visit. If you have anxieties about visiting the dentist, let the staff know. There are steps that they can take to help ease your fears and make your visit to the Aurora emergency dentist more comfortable. A dental emergency can make your visit to Aurora an extremely trying time. Dental emergencies can strike you when you do not have the time to waste searching through a large list of dentists in the area. We at Emergency Dentists USA have done the work for you. We created a list of qualified emergency dentists available for your emergency toothache, cracked tooth, or soft tissue injury. If you have an abscess or an issue with your crown, your Aurora emergency dentist can handle your emergency for you in a quick manner. These types of emergencies are frightening experiences that require prompt treatment, and our dentists are there to handle your situation in a fast manner for you. Call our 24-hour hotline and we will connect you to the right emergency dentist for your situation. 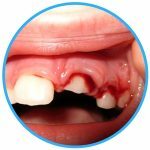 Emergencydentistsusa.com is not substitute for seeing a medical professional and since every situation is unique you should see a dentist for any of the situations below. 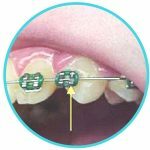 Broken or loose braces or wires can be extremely irritating. They can poke or rub your tongue, gum, or cheek, causing irritation or bleeding. When this happens, try using an eraser from a pencil to push the wire into a position where it no longer irritates the area. If that doesn’t work, try covering the end of the wire with orthodontic wax, gauze, or cotton until you can get into the Aurora emergency dentist. Do not cut the wire as this can lead to complications. 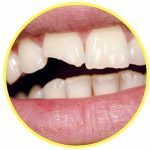 Broken or chipped teeth are a scary experience. If this should happen, save any pieces of the tooth that you can find. Rinse the pieces and place them in a container with either milk or water with a bit of salt. Apply a piece of gauze if you have any bleeding until the bleeding stops. A cold compress applied to the outside of the mouth near the broken tooth can help relieve pain and keep swelling down. See your Aurora emergency dentist as soon as you can. Having a tooth knocked out is an extremely stressful situation, but if treated within an hour, usually the tooth can be saved. If this should happen, retrieve the knocked-out tooth and rinse the root if it is dirty, being careful to hold it by the crown and not the root. Do not scrub it or remove any attached tissue. Try to place the tooth back in the socket, but do not force it. If you can not replace it, put the tooth in a small container of milk or a cell growth medium. Contact your Aurora emergency dentist as soon as possible. An emergency tooth extraction is the complete removal of a tooth from inside the jawbone. There are a number of reasons that a tooth extraction be recommended. A few include unrestorable broken tooth, root fracture, tooth infection that impacts the jawbone, and periodontal disease. Having a tooth extracted is an irreversible procedure. A tooth extraction appointment will include a full review of your medical and dental history, an x-ray, and treatment options. The tooth is then numbed with a local anesthetic or a general anesthetic will be used. The dentist then pulls the tooth from the gum and a piece of gauze is placed over the hole to control bleeding. The healing process takes about one to two weeks. It is important that you not smoke, drink alcohol, or drink from a straw during the first 24 hours in order to give the blood clot time to form to aid in healing. Normal activities can be resumed as tolerated. Call the dentist should extreme pain, bleeding, or swelling occurs. Your Aurora emergency dentist is capable of handling any dental emergency you have, and they are the best choice when it comes to handling an emergency dental situation. The hospital emergency room is there should you not be able to get into see your Aurora emergency dentist or should you have an accident that damages more than just a tooth such as a head injury from a car accident or sport. The emergency room department is not designed to treat dental issues, but they can x-ray and prescribe medication to get you through until you can get in to see your Aurora emergency dentist. A visit to the emergency room is expensive and is not the right choice for lost fillings or crowns. They are not equipped to handle dental emergencies such as these. Those emergencies should be seen by your Aurora dentist. Always check with the local dental society to be certain that the dentist you choose is certified and licensed in Aurora. The American Dental Association website has the information you need. You can also find more information on certification and licensing on the Illinois State Dental Society website. Both sites provide you with information regarding Aurora emergency dental clinics and are there to help you make an informed decision. Should you not be able to reach your Aurora emergency dentist and you have a dental emergency, call 911 or go to the nearest hospital emergency room for treatment. The Emergency Dentists USA website is designed for informational purposed only and does not replace the advice of a trained medical professional.